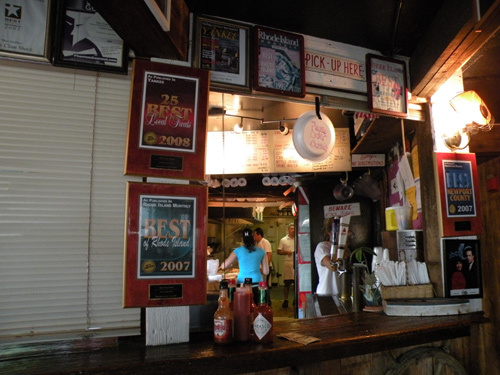 One of my favorite Newport restaurants, Flo's Clam Shack has been pleasing palates with great seafood since 1936. 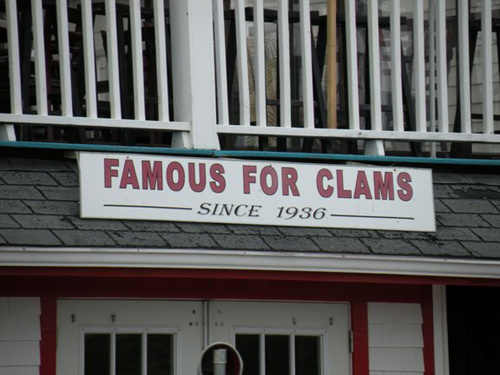 If you're in the mood for awesome clamcakes, a cold beverage and a nice view of 1st Beach, then look no further than this Newport institution. 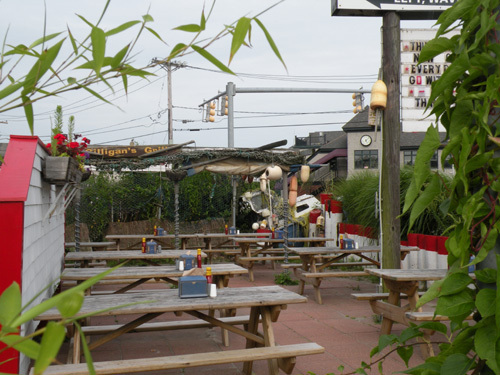 Flo's is located at 4 Wave Avenue (just over the border in Middletown), directly across the street from 1st Beach and the Atlantic Beach Club. The victim of many hurricanes over the years, Flo's has moved a few times, but has been at this ideal location since 1992. If you're driving here, there's parking in the back off of Wave Avenue. 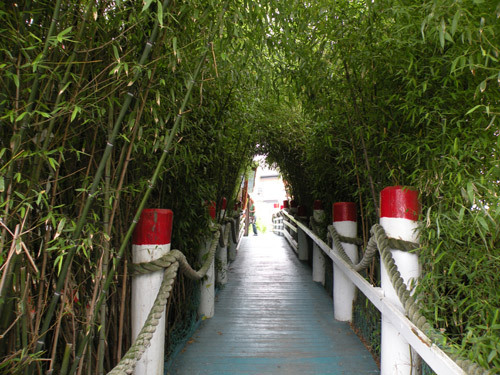 Just follow the path, and your tastebuds will be in heaven soon enough! Before I forget, I need to tell you that this is one of the Newport restaurants that doesn't take credit cards, so be sure to bring cash! It would be devastating to get there, smell the food and place your order only to find out that you don't have any cash. Don't let that happen to you! You have the choice of sitting inside, outside, or upstairs on the deck overlooking 1st Beach. Once you place your order at the counter, they'll give you a rock with a number on it. Make sure you hang onto it and listen for your number to be called. 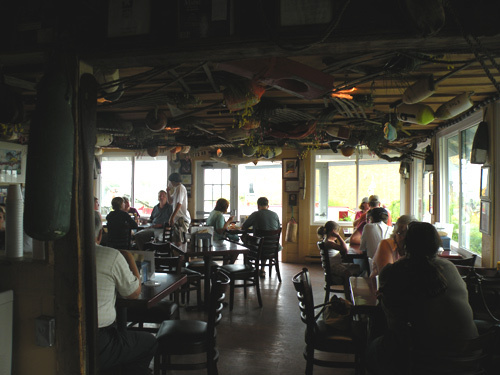 The decor and ambiance inside are really cool, but it's also nice to sit outside and enjoy the cool ocean breeze. You can't really go wrong either way. On my most recent visit, I got the food to go. Although it's nicer to eat there, once I bit into my clam cakes, I didn't really care where I was. I was in heaven already! 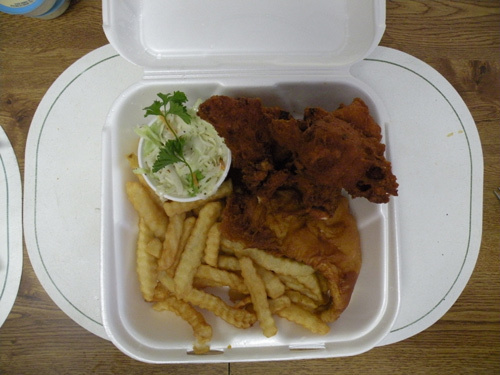 Fish, clam cakes, fries and cole slaw...yummm!!! 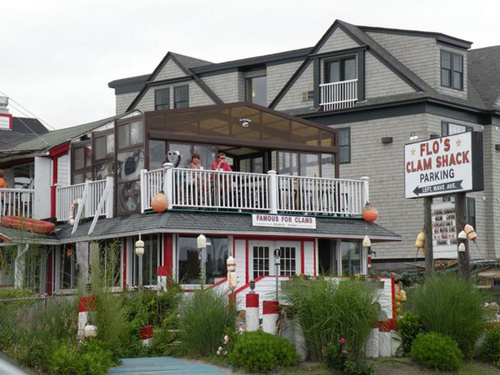 If you're looking for one of the best Newport RI restaurants with perfect ambiance and great service, look no further than Flo's Clam Shack.